In this blog post we'll continue our journey from zero permissions to code execution in the TrustZone kernel. 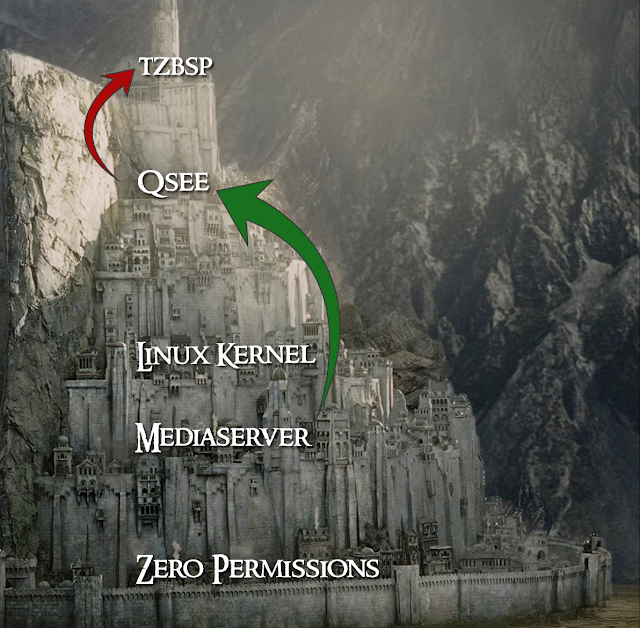 Having previously elevated our privileges to QSEE, we are left with the task of exploiting the TrustZone kernel itself. "Why? ", I hear you ask. We could hijack any QSEE application directly, thus exposing all of it's internal secrets. For example, we could directly extract the stored real-life fingerprint or various secret encryption keys (more on this in the next blog post!). We could disable the hardware protections provided by the SoC's XPUs, allowing us to read and write directly to all of the DRAM. This includes the memory used by the peripherals on the board (such as the modem). As we've previously seen, we could blow the QFuses responsible for various device features. In certain cases, this could allow us to unlock a locked bootloader (depending on how the lock is implemented). So now that we've set the stage, let's start by surveying the attack surface! Qualcomm's Secure Environment Operating System (QSEOS), like most operating systems, provides services to the applications running under it by means of system-calls. As you know, operating systems must take great care to protect themselves from malicious applications. In the case of system-calls, this means the operating system mustn't trust any information provided by an application and should always validate it. This forms a "trust-boundary" between the operating system itself and the running applications. So... This sounds like a good place to start looking! Let's see if the TrustZone kernel does, in fact, cover all the bases. So we know how syscalls are invoked, now let's look for the code in the TrustZone kernel which is used to handle SVC requests. Recall that when executing an SVC instruction in the "Secure World", similarly to the "Normal World", the "Secure World" must register the address of the vector to which the processor will jump when such an instruction is invoked. 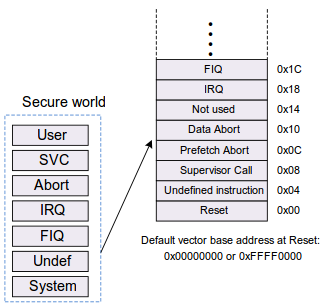 Unlike SMC instructions (used to request "Secure World" services from the "Normal World"), which use the MVBAR (Monitor Vector Base Address Register) register to provide the vector's base address, SVC instructions simply use the "Secure" version of the VBAR (Vector Base Address Register). 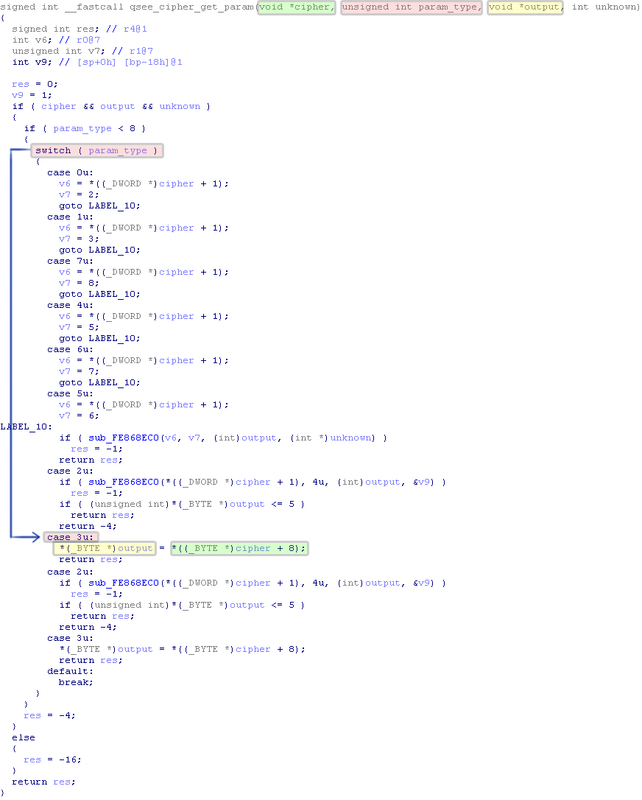 At this point we can start tracing the execution from the SVC handler in the vector table. ...Okay... That's a lot of code. However, on closer inspection, the graph seems very shallow, so while there are a lot of different code-paths, they are all relatively simple. In fact, the function is simply a large switch-case, which uses the syscall command-code supplied by the user (in R0) in order to select which syscall should be executed. But something's obviously missing! Where are the validations on the arguments passed in by the user? app_syscall_handler does no such effort, so this means the validation can only possibly be in the syscalls themselves... Time to dig deeper once more! 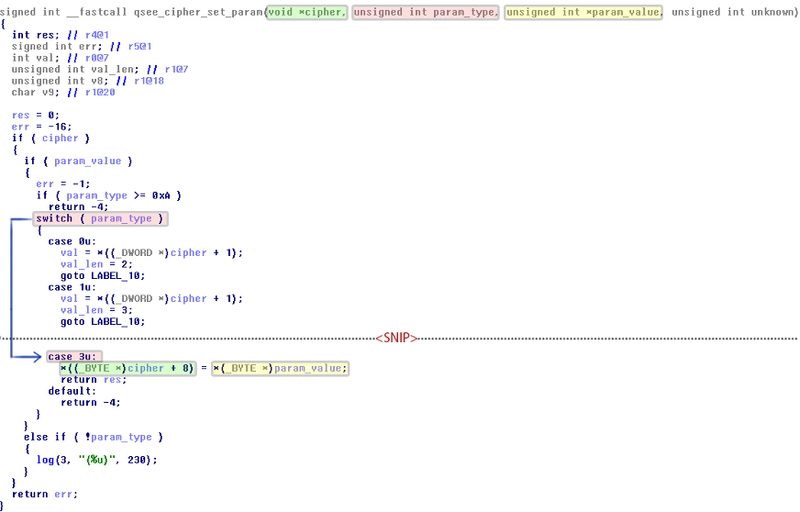 As you can see, there is some logic behind the "grouping" of each set of syscalls. For example, the sixth table (above) contains only syscalls relating to memory management (although, admittedly, most tables are more loosely cobbled together). Finally, let's take a look at a simple syscall which must perform validation in order to function correctly. A good candidate would be a syscall which receives a pointer as an argument, and subsequently writes data to that pointer. Obviously, this is incredibly dangerous, and would therefore require extra validation to make sure the pointer is strictly within the memory regions belonging to the QSEE application. A pointer to a "cipher" object, which has previously been initialized by calling "qsee_cipher_init"
This is our lucky day! Apparently the TrustZone kernel blindly trusts nearly all the parameters passed in by the user. Although the function does perform some sanity checks to make sure the given pointers are not NULL and the param_type is within the allowed range, it automatically trusts the user-supplied "output" argument. More importantly, we can see that if we use the parameter type 3, the function will write a single byte from our cipher to the supplied pointer! 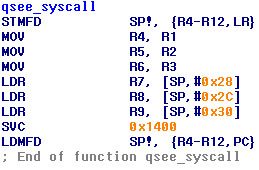 Note that this was more than just a stroke of luck - taking a peek at the implementation of all the other syscalls reveals that the TrustZone kernel does not perform any validation on QSEE-supplied arguments (more specifically, it freely uses any given pointers), meaning that at the time all syscalls were vulnerable. 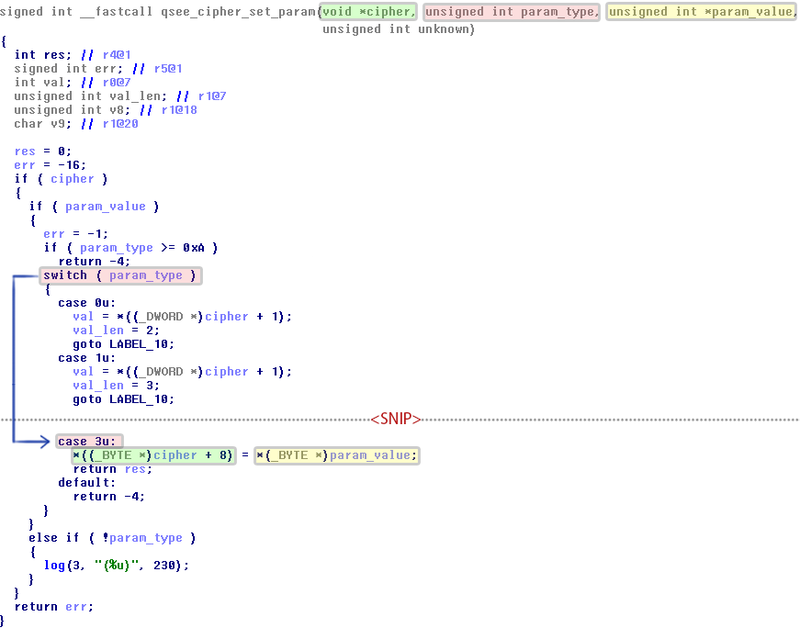 For the sake of our exploit, we'll stick to qsee_cipher_get_param, since we've already started reviewing it. As always, before we start writing an exploit, let's try and improve our primitives. This is nearly always worth our while; the more time we spend on improving the primitives, the cleaner and more robust our exploit will be. We might even end up saving time in the long-run. Right now we have an uncontrolled-write primitive - we can write some uncontrolled data from our cipher object to a controlled memory location. Of course, it would be much easier if we were able to control the written data as well. It looks like we can set the parameter's value by using the same param_type value (3), and supplying a pointer to a controlled memory region within QSEE which will contain the byte we would later like to write. The TrustZone kernel will happily store the value we supplied in the cipher object, allowing us to later write that value to any address by calling qsee_cipher_get_param with our target pointer. You might have also noticed that we could use the inverse of this in order to get an arbitrary read primitive. All we would need to do is call qsee_cipher_set_param supplying the address we'd like to read as the param_value argument - this'll cause the TrustZone kernel to read the value at that address and store it in our cipher object. Then, we can simply retrieve that value by calling qsee_cipher_get_param. Using the primitives we just crafted, we finally have full read-write access to the TrustZone kernel. All that's left is to achieve code-execution within the TrustZone kernel in a controllable way. ...However, we have already come across a piece of dynamically allocated code in the "Secure World" - the QSEE applications themselves! So here's a plan - if we could ignore the access-protection bits on the code pages of the QSEE applications (since they are all marked as read-execute), we should be able to directly modify them from the context of the TrustZone kernel. Then, we could simply jump to the our newly-created code from the context of the kernel in order to execute any piece of code we'd like. Luckily, ignoring the access-protection bits can actually be done without modifying the translation table at all, by using a convenient feature of the ARM MMU called "domains". In the ARM translation table, each entry has a field which lists its permissions, as well as a 4-bit field denoting the "domain" to which the translation belongs. Within the ARM MMU, there is a register called the DACR (Domain Access Control Register). This 32-bit register has 16 pairs of bits, one pair for each domain, which are used to specify whether faults for read access, write access, both, or neither, should be generated for translations of the given domain. Whenever the processor attempts to access a given memory address, the MMU first checks if the access is possible using the access permissions of the given translation for that address. If the access is allowed, no fault is generated. Otherwise, the MMU checks if the bits corresponding to the given domain in the DACR are set. If so, the fault is suppressed and the access is allowed. This means that simply setting the DACR's value to 0xFFFFFFFF will cause the MMU to enable access to any mapped memory address, for both read and write access, without generating a fault (and more importantly, without having to modify the translation table). Moreover, the TrustZone kernel already has a piece of code that is used to set the value of the DACR, which we can simply call using our own value (0xFFFFFFFF) in order to fully set the DACR. All that said and done, we're still missing a key component in our exploit! All we have right now is read/write access to the TrustZone kernel, we still need a way to execute arbitrary functions within the TrustZone kernel and restore execution. This would allow us to change the DACR using the gadget above and subsequently write and execute shellcode in the "Secure World". As we've seen, most QSEE system-calls are invoked indirectly by using a set of globally-stored pointers, each of which pointing to a corresponding system-call table. While the system-call tables themselves are located in a memory region that is protected by an XPU, the pointers to these tables are not protected in any way! This is because they are only populated during runtime, and as such must reside in a modifiable memory region. This little tidbit actually makes it much simpler for us to hijack code execution in the kernel in a controllable manner! 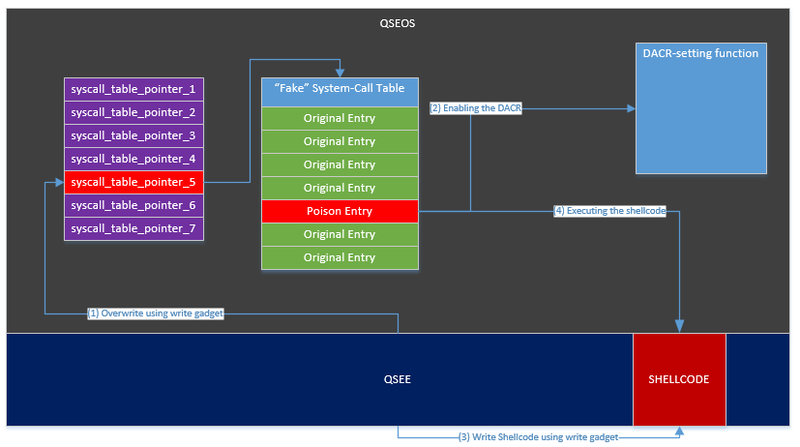 All we need to do is allocate our own "fake" system-call table. 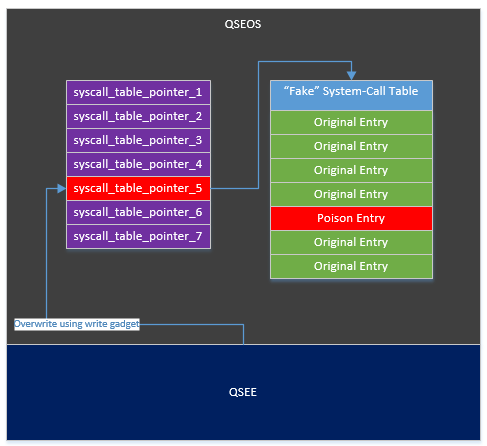 Our table would be identical to the real system-call table, apart from a single "poisoned" entry, which would point to a function of our choice (instead of pointing to the original syscall handler). It should be noted that since we don't want to cause any adverse effects for other QSEE applications, it is important that we choose to modify an entry corresponding to an unused (or rarely used) system call. 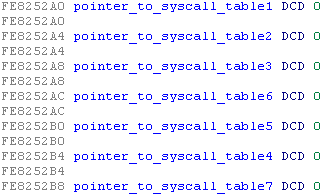 Once we've crafted the "fake" syscall table, we can simply use our write primitive in order to modify the global syscall table pointer to point to our newly created "fake" table. Then, whenever the "poisoned" system-call is invoked from QSEE, our function will be executed within the context of the TrustZone kernel! Not only that, but app_syscall_handler will also conveniently make sure the return value from our executed code will be returned to QSEE upon returning from the SVC call. By now we have all the pieces we need to write a simple exploit which writes a chunk of shellcode in the "Secure World", executes that shellcode in the context of the TrustZone kernel, and restores execution. Invoke the "poison" syscall in order to jump to our newly-written shellcode from the context of the TrustZone kernel! 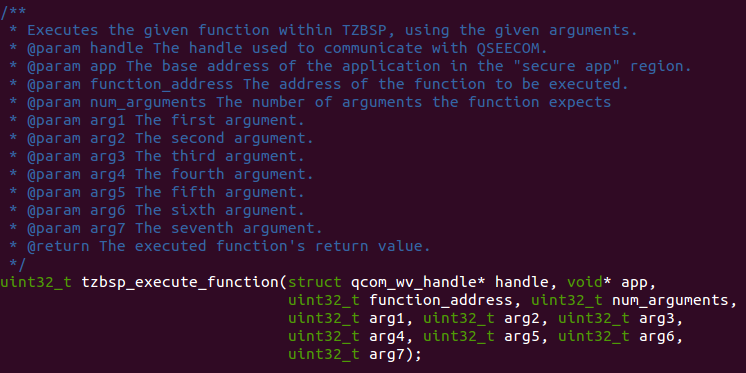 tzbsp_execute_function - calls the given function with the given arguments within the context of the TrustZone kernel. tzbsp_load_and_exec_file - Loads the shellcode from a given file and executes it within the context of the TrustZone kernel. I've also included a small shell script called "build_shellcode.sh", which can be used to build the shellcode supplied in the file "shellcode.S" and write it into a binary blob (which can then be loaded and executed using the function above). As far as I know, this vulnerability has been present in all devices and all versions of QSEOS, until it was finally patched in 02.05.2016. 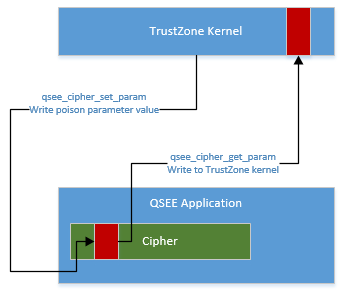 This means that effectively up to that point, obtaining code-execution within QSEE was equivalent to having code-execution within the TrustZone kernel (i.e., fully controlling nearly every aspect of the device). As there was no public research into QSEE up to that point, this issue wasn't discovered. Hopefully in the future further research into QSEE and TrustZone in general will help uncover similar issues and make the security boundary between QSEOS and QSEE stronger. how can we supply it with normal shell commands like execv or chmod or setguid? Thank you for reading the post. As the the shellcode - it's executed in the TZ kernel, which isn't a POSIX OS, but rather a proprietary OS written by Qualcomm. This means you don't have any commands like "execv", etc. 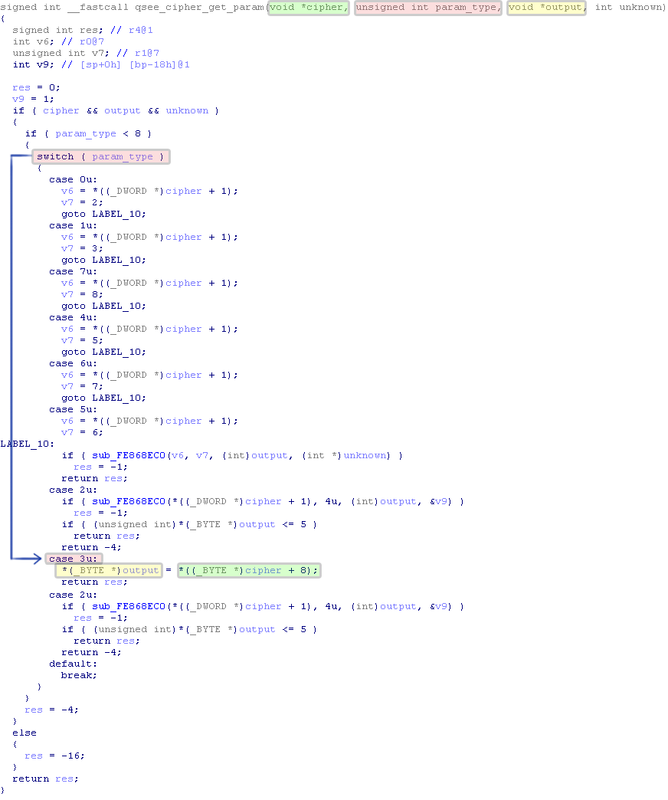 Instead, you can directly execute assembly code in the kernel. Just write the ARM assembly you want to execute under shellcode.S, run build_shellcode.sh, and execute the exploit with the generated payload. is there anything while we are adapting it into aarch64 architecture? The code you posted would work when running an application *under the Linux Kernel*. In this case, we are executing shellcode directly in the TrustZone kernel - so no SWIs (because there are no syscalls to call - you're already in the kernel), also no public documentation available for whatever APIs are exposed in the TZ kernel. I did post some neat stuff you could do from that context, like reading/writing QFuses, and hijacking the "Normal World" OS (see previous posts). I'm going to upload another post soon about more interesting stuff you can do using the TZ kernel. Hi laginimaineb. Sorry for spamming but I have decided to put my questions here as in most blog to be seen. 1) How did you define the values SECURE_APP_REGION_START, SECURE_APP_REGION_SIZE ? Are these value same for different families of the Qualcomm SoC's ? 2) What is the memory management of the TZ kernel ? While scanning the secapp region, the trustlet is crushed, I suppose by the TZ kernel, in case if it tries to access not own memory region. What is the probability that TZ kernel will load the crashed trastlet in the same memory ? 3) And stupid question... Does TZ kernel operate with the virtual addresses or with physical addresses through switching the modes by means of the special flags in the system register/s ? No problem! Sorry if I missed your questions earlier. 2. That's a great question, but hard to answer. I've reversed some of the code responsible for loading applications in the secure region, but don't have a definitive answer... Sorry. 3. The MMU is always present, so we're always working with virtual addresses. But - most TZ kernel contexts simply have a "flat" translation table - that is, every virtual address is mapped to the corresponding physical address. You could change the mappings and map in whatever you like, just like you would in a regular kernel. It seems my last comment was lost. Strange. You replied "But - most TZ kernel contexts simply have a "flat" translation table - that is, every virtual address is mapped to the corresponding physical address." It was my doubt, thanks. Another interesting thing is to estimate the memory range allocation by the TZ kernel to find out whether the memory range from the secapp region will be reserved for the specific TA once it was run within a cycle from CPU's reset to reset. Another words, to find out whether the TZ kernel retains metadata to indentify the specific TA to load it in the predefined (where it was loaded at the first time) place. Run exploit at first time to find memory location. Modify the exploit so that to load another one TA after crashing the original TA and compare the result. 1) When are the /persist/data/app_g/sfs/*.dat files decrypted ? Immediately after invoking the QSEE_sfs_open or before read/write operations ? 2) Is it possible to load encrypted TA for security reason. Does Qualcomm's secure kernel support such feature ? It can be useful to prevent analyzing of the TA's. Did you ever face with the encrypted secure kernel which is decrypted on boot up by means of boot loader ? In my opinion it would decrease the number of 0-day vulnerabilities. 3) I noticed that the data segment is used to allocate/deallocate the dynamic memory through the SVC directed to the TZ kernel. But how we can find the bottom of the stack and its size ? As I understand, it is possible to dump out whole current state of the TA if somehow read the data segment. Right ? Because she/he will dump the static and dynamic memory. 4) The R9 register is used to point to the data segment and it is initialized by the sub_50() but I didn't find any reference to this function. When it is invoked and who it invokes ? For some reason blogger marked your comment as spam... I un-spammed it. About the allocation pattern - I'm pretty sure there's randomization involved. Booting the device up normally twice results in two different load addresses (deduced on an older MSM8974 device, on which I have TZ kernel code exec without going through QSEE). 1. The SFS always remains encrypted on the flash, it's only decrypted on a per-block basis in QSEE's memory, never on-disk. 2. This kind of model isn't used on QC devices, but you can find something rather similar in the Apple ecosystem. There's a Crypto Engine which has different GID keys accessible to each core, which are used to decrypt the firmware itself only on-chip. It might help, but one could argue that it's also doing some damage... On the one hand, it prevents researchers from looking for bugs. On the other hand, government agencies/people with access to the source code will be more likely to find bugs, since the code hasn't been audited by white-hats at all. Anyway, as far as I know, there's no support for such a feature. 3. Once you have code-execution in QSEE, you can dump the whole data segment and, as you said, you'll get the full state of the application (stack, heap, globals). 4. It's initialized by the TZ kernel when setting up the context for the QSEE application (before jumping in to the application's initialization function). Thanks for the very informative reply! Pay attention on the permission for the 3-rd program header. It contains code and has RWE permissions. Does it mean that this version of tz uses self-modified code ? Also it demands fixing the virtual address for 2-nd and 3-rd program headers. but one of your blog (exploring-qualcomms-trustzone) claims that the address of the start symbol is loaded in the monitor vector base (MVBAR). What statement is correct ? 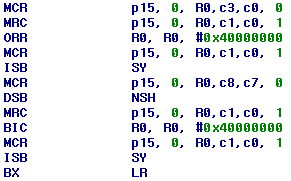 The segments that you pointed out refer to a special memory region which initially contains the TZ code, but only when the device is booting. Afterwards the TZ code isn't actually stored at that address but rather at the location of the special NULL segment you pointed out. I explained some of this in the very first TZ blog post, but in short you need to remove the dummy NULL segment from the ELF and relocate the third and fourth segments to their correct load address. Oh and the MVBAR was a mistake in the older blog post, it's actually the secure MVBAR. So in this scenario what is the correct address of third and four segment? How do I find it? I tried to give 0xfe840000 to the third segment with RWE permissions, 0xfe843c00 to the fourth segment and invalid address(0xfe890000) to Null segment . However, I see lot of un-referenced code. Could you please help me here? When you change the load addresses does the binary load correctly in IDA? If so, which segment contains the unreferenced code? I would try and look for pointers to invalid memory locations in other segments and try and correlate those with the addresses in the incorrect segment. Did you ever try to change the pointer to the SMC handler from the monitor vector table from the secure world user mode context ? I mean whether is it possible to change the address space of the TZ kernel at address 0xfe80de28 (pointer to the smc handler) from the trustlet ? Thanks for the information! Your posts are all really good!! I have a few doubts though. Can you make a post about how would it be possible to blow fuses and get keys from the qsee to then unlock the bootloader? Already done! You can check out the post about unlocking the Motorola bootloader. We could hijack any QSEE application directly, thus exposing all of it's internal secrets..."
I guess this is not true...since in your next post (extracting qualcomm keys) you mention that one application cannot interact with another due to XPU constrains. Am i correct? Thanks once again for your excellent posts! Trustlets can't interact with one another directly, but instead rely on the TrustZone kernel to do so. Therefore, as I wrote, the kernel can be used to hijack any trustlet. Read the next blog post in the series (breaking FDE) for more information. I own an AT&T Galaxy S5 (MSM8974 SoC), so my bootloader is locked down tight. However, if we were to use this exploit to get full access to the TrustZone, wouldn't we be able to overwrite the public key use to verify firmware packages, and replace it with a key that has a publicly available private key? (Or better yet remove the verification step entirely, but that doesn't sound very possible).